Memory #1 in our new condo: The first meal! I think most of us would agree that there are few moments in life that are more exciting than becoming a homeowner for the first time. Back in July, Mark and I had our counter-offer on a condo accepted and we took possession yesterday - Even though we don't officially move 'til August 14, naturally we wanted our first meal for our first evening at our condo to be special! Pizza and beer would be easier, yes, but we are saving that for our friends when they help us move. Cooking was also a great way to test that all our appliances were in working order. 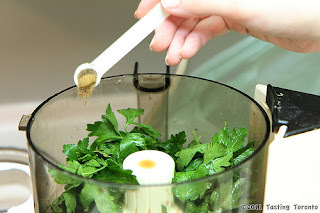 We decided to tackle making homemade chimichurri sauce - which turned out amazing and which we are now addicted to (we have had it before, but only in restaurants - it was so simple to make!) We spooned it over a steak that we cooked in our cast iron skillet. We also just cooked up some quick gnocchi (admittedly not from scratch - it was late and we were hungry!) with lots of parmigiano reggiano on top. We also baked some simple zucchini slices on stoneware with a bit of salt and olive oil in the oven. They were delicious. Then for dessert we made my mom's simple recipe for apple crisp, or apple crumble as some call it. So delicious! And we forgot oven mitts so umm we had to be creative :P But we made it work! Memory #1 in our first home: MADE. And it was a delicious memory indeed!